The district estimates that 26 percent of its children come to kindergarten without any prior preschool or formal child care experience. With a kindergarten enrollment of more than 1,200 students, the numbers of children without preschool can quickly add up, having an annual ripple effect in later grades. Rather than hitting the ground running with all children, remediation and behavior management too often become the district’s focus. “To get kids up to grade level and beyond, we need the foundational skills in early childhood,” said district Chief Academic Officer Jason DeFalco. The Smooth Sailing Into Kindergarten calendar is one piece of the community’s strategy, and at the Keith Middle School event, hundreds of new 2015-16 calendars were distributed to attendees, to be, in turn, shared with parents. In previous years, the calendar was distributed throughout preschool classrooms to parents of 4-year-olds. Knowing that 26 percent of children are not accessing any preschool, this year’s focus has been to reach children wherever they are. This work relies on partnerships with public housing, pediatricians, public libraries, play groups, human service organizations like DCF and WIC, and other community organizations that serve families. The calendar begins with September, and it is designed to provide school readiness activities throughout the year leading up to kindergarten. Its theme is parents as children’s first teachers and the home as the classroom, and it has tips for embedding language and literacy in everyday activities. These activities are aligned with the Massachusetts Curriculum Frameworks for English Language Arts and Literacy. The calendar was created through a collaboration between PACE Child Care Works (the Child Care Resource and Referral agency for New Bedford) and the New Bedford Public Schools, with state funding support. 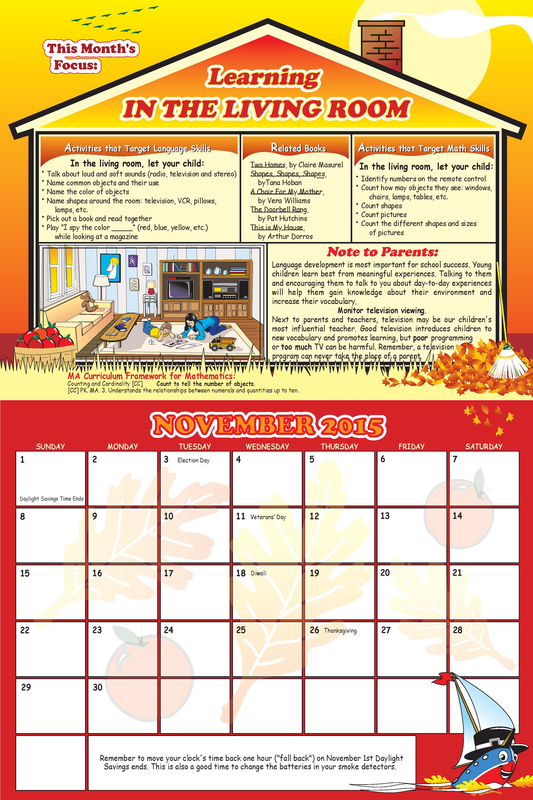 Each month, PACE Child Care Works will include literacy tips from the calendar in its monthly newsletter to families. The monthly updates will culminate in a kindergarten registration and transition event being planned for children and families in August 2016. The calendar and kindergarten readiness push are part of a larger effort underway in New Bedford. Facilitated by David Jacobson of the Education Development Center, The B-3rd Partnership has been working for the past year on a variety of strategies to better serve young children and their families. These range from professional development in early literacy and social-emotional learning, to engaging families of young children through parent cafés and other approaches. The Partnership’s goal is to ensure equitable access to high-quality early learning experiences, improve health and wellness, and promote meaningful family engagement, all to prepare children for success in school and beyond. New Bedford is also a Campaign for Grade-Level Reading community, led by the Greater New Bedford Early Literacy Consortium (ELC). The ELC merged with the B-3rd Partnership at the start of the grant, and the two initiatives have aligned their efforts. Strategies for Children is a partner in these efforts, and as the state lead for the national Campaign, shares best practices across communities, and uses lessons learned to inform state policy and advocacy. 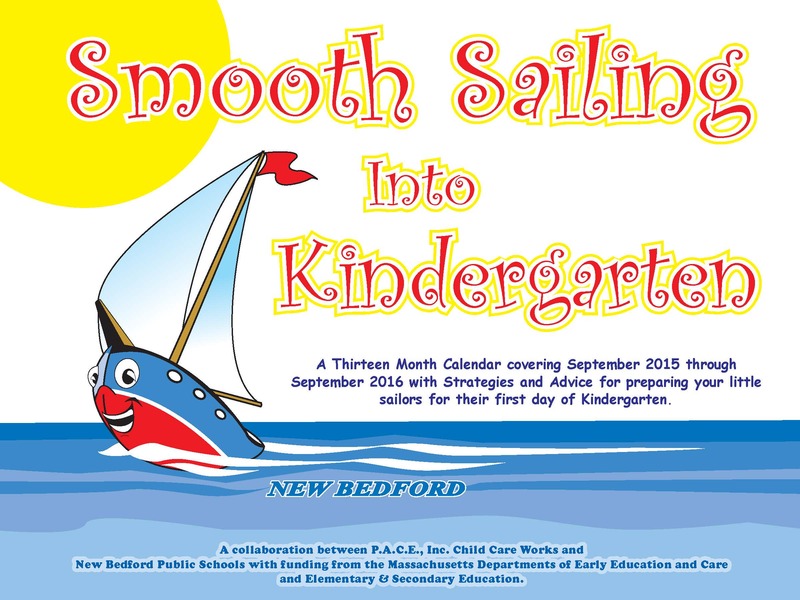 To build on New Bedford’s proud maritime heritage, the ELC and Partnership members wanted a campaign that would hone in on early literacy during children’s first three years and align with the calendar’s “Smooth Sailing” theme and activities for 4-year-olds. 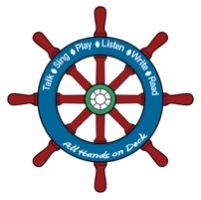 Since anyone in the community can help support young children’s language and literacy, the chosen theme was “All Hands on Deck.” The ship’s wheel logo, designed by partner Deb Smook of New Bedford ArtWorks!, was used to convey the multiple dimensions of early literacy and language, such as singing, talking, and listening, as well as reading. A Spanish language logo is also available. The goal is to promote the logo throughout the community, and have partners use the logo in their own print materials, online resources, and social media. For the B-3rd Partnership, literacy is a clear focus. At the event on the 13th, participants were presented with research and practical classroom tips from Lisa Dion, the district’s Curriculum Manager and Literacy Director, and Patricia Farrell, a literacy consultant working with the district. Dion and Farrell were chosen by the Partnership to provide a six-session early literacy professional development program this fall, a joint-training session for school- and community-based preschool teachers. Social-emotional learning is another focus of the B-3rd Partnership. The district is offering joint professional development in the “pyramid model” developed by the Center on the Social and Emotional Foundations of Early Learning (CSEFEL). As we’ve blogged, social-emotional learning (SEL) is increasingly capturing the interest of practitioners and policymakers. The SEL focus for New Bedford helps address an increasing need and was identified early on as a priority by Partnership members. “New Bedford is setting an important precedent for joint professional development,” Jacobson told attendees. He has seen this type of collaboration become a key ingredient in other communities’ successes. The B-3rd Partnership was made possible through a Department of Early Education and Care grant, funded through the state’s Race to the Top – Early Learning Challenge award. The EEC grant, which was awarded to 11 Massachusetts communities engaged in similar efforts, expires in December, but the many partners in New Bedford are eager to continue their work and will be crafting a sustainability plan over the next two months. B-3rd alignment and collaboration can unite a community around important goals and prepare it to successfully implement larger initiatives like preschool expansion. Strategies for Children sees “community readiness” as a necessary condition for a healthy, vibrant early education sector that invests resources wisely in order to have a lasting impact on children. New Bedford has spent the past year doing good work and building a thoughtful, comprehensive strategy to support young learners. As its work continues, the community is well-poised to improve outcomes for its children and families.